The other response I keep getting is that dumb, corny comment about it not being green. So it seems like the only thing we collectively understand about Greenland is that it’s a place to go and it has a hypocritical name. I first became aware of how little we know about Greenland when I was creating NASA’s Global Ice Viewer for our climate website. I found shots from Alaskan glaciers that dated all the way back to the late 1800s for the gallery. Gents with top hats and ladies in bustles with Victorian cameras stood on the ice. But Greenland? Photos taken before the 1980s are extremely rare. Muir Glacier, Alaska, disappears. Left image: 1891. Right image: 2005. Photographed by G.D. Hazard in 1891 and by Bruce F. Molnia in 2005. Courtesy of the Glacier Photograph Collection. Boulder, Colorado, US and the National Snow and Ice Data Center/World Data Center for Glaciology. And while most people understand that increased atmospheric temperatures have been melting the ice sheet from above, global warming has also been increasing ocean temperatures. And this means the ocean waters surrounding Greenland are also melting the ice sheet from around its edges. 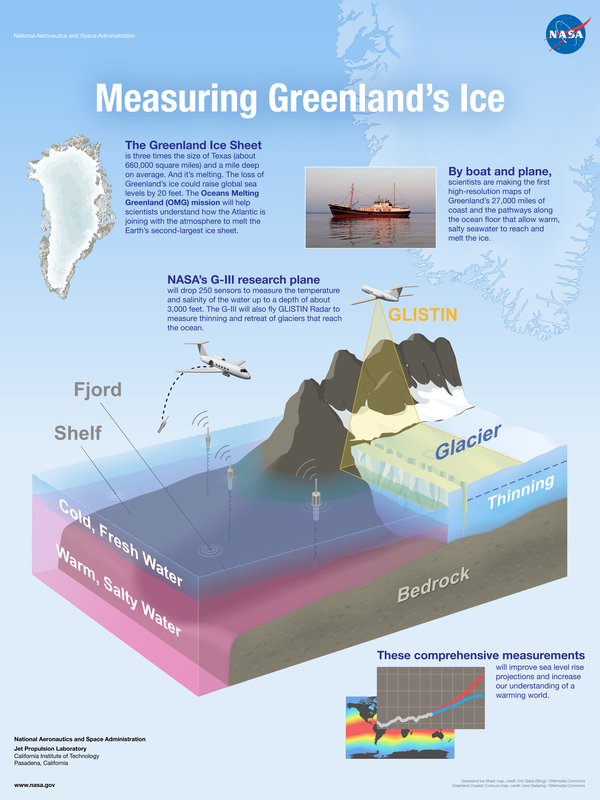 Which is the reason I’m headed up there with NASA’s Oceans Melting Greenland (OMG) campaign in the first place: to measure the temperature and salinity of those unknown waters. See, the fresh water that flows into the ocean from ice melt is about 0 degrees and less dense, so it floats right at the sea surface. The North Atlantic Ocean Water is about 3 or 4 degrees, salty and denser, so it sits right below the fresh melt water. And these two waters don’t really mix much. When the 3- or 4-degree North Atlantic Ocean Water gets in contact with Greenland’s ice sheet, it’s warm enough to melt it. But no one knows the melt rate yet. No one. Even though Greenland’s melting ice sheet impacts each and every one of us right now. The rate of ice melt will determine how much sea level rise we’re going to get, 5 feet or 10 feet or 20, everywhere, all over planet Earth, not just in Greenland, but at coastlines near you and me. This is where that whole NASA “exploring the unknown” theme comes in. Next week, the OMG team (including yours truly) will be in Greenland on NASA’s G-III aircraft. We’ll spend five weeks flying around the entire coastline, measuring the salinity and temperature of the coastal waters by dropping 250 Aircraft eXpendable Conductivity Temperature Depth (AXCTD) science probes through a hole in the bottom of the plane. The reason we’re going in September is that’s the warmest time of the year in the ocean, the ice will reach its lowest extent and we’ll be able to measure as much of the coast as possible. The plan is to repeat the same mission for five years to find out what the melt rate is and how much that rate is increasing. Am I excited? Yes, beyond. Aside from the science preparation, it took months and months of personal prep. I passed a Federal Aviation Administration medical exam, then got trained in First Aid, CPR, AED, hypoxia, disorientation, survival, and hearing conservation, and then had to buy steel-toed shoes, which are required to fly on that NASA plane. Today, I am psyched beyond belief. Underwater disorientation training in action. Why else would anyone work so hard to do something? Just like the rest of the team, I hope our work really makes a difference. Find out more about Oceans Melting Greenland. View and download OMG animations and graphics. Oceans Melting Greenland is part of NASA Earth Expeditions, a six-month field research campaign to study regions of critical change around the world.